Probiotics are foods, drinks or supplements that contain beneficial microorganisms. Our health relies on having a healthy and diverse set of microbes living in our gut and eating probiotics is one way to get the good bacteria where we want them! The bacteria in our gut communicate with the immune system. A study in which researchers treated patients with rheumatoid arthritis with probiotics nicely demonstrates this: Researchers found that by supplementing with the beneficial bacteria strain Lactobacilli casei disease symptoms significantly decreased. The beneficial bacteria helped to regulate the immune system by lowering pro-inflammatory protein levels and increasing anti-inflammatory ones . When treating inflammatory bowel diseases medications seem to fail more often than not. 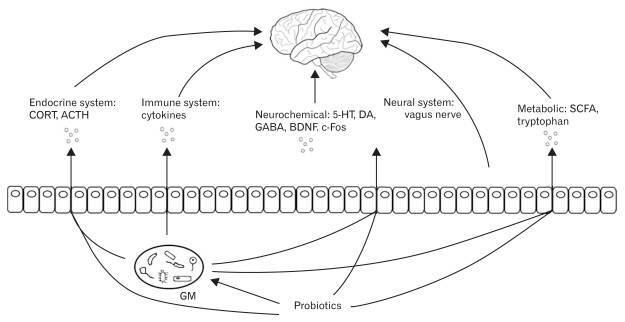 However, frontline research shows how probiotics can decrease inflammation in the bowel and treat its symptoms. Supplementation with two species of Lactobacilli showed an improvement in disease severity after only 8 weeks . Good bacteria also prevent us from infections with the disease-causing kind of bacteria. Many research studies show how the administration of different probiotics help to fight Candida infections . 6 Reasons you sould take Probiotics! Buying probiotic pills is one way to obtain some probiotics. Probiotic supplements vary in the number of different probiotic strains they include. Usually, it would be good to go with a product that contains a high number of different species. However, if you want to get all you need from your diet or if you don’t want to use supplements, then fermented food is the way to go! Fermentation is a technique that was used for millennia to preserve food. Only with the invention of the refrigerator in the 20th century we started to forget about our close relationship with fermented food. There are a few fermented foods you can easily buy at grocery stores that still contain living bacteria. Yogurt is a good starting point as it usually contains two or more probiotic bacteria. Then there are Kefir and Kombucha as somewhat refreshing beverages that can be found at most groceries stores. However, producing these yourself is super easy and I recently really got into it and enjoy the process a lot and it also saves you quite some money. Both contain a huge variety of bacteria and yeast. Kefir, for instance, has more than 50 different microbes . There is also quit some research out there showing the health benefits of these fermented beverages but this again would exceed the focus of this blog. Another two great dishes you can make yourself are Sauerkraut and Kimchi. Unfortunately, the kind you buy at the grocery store is usually pasteurized and doesn’t contain living bacteria anymore. But again, making them yourself is super easy. Apart from introducing good microbes through probiotic foods, all fermented food is also loaded with vitamins and other molecules the microbes produce during the fermentation process. If you feel a little off because you had some bad-food days, or you were drinking at the weekend or you had to use a antibiotics, definitely consider to include probiotic food for the next couple days! Tim Spector: "The Diet Myth"